The Wit of Cricket at Home and Abroad. « Johnners: Cricketing Gaffes, Giggles and Cakes. From the producers of the Number One bestselling CD The Wit of Cricket, here is their latest collection of the funniest cricket stories at home and abroad, recorded live at Great Brickhill Cricket Club in Bedfordshire. 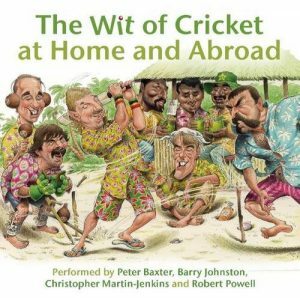 Featuring a rare live recording of the late cricket commentator Christopher Martin-Jenkins, who was a brilliant after-dinner speaker, here are dozens of hilarious anecdotes about the Ashes, overseas tours, sledging, Test Match Special, and much more! Christopher Martin-Jenkins commentated on TMS from 1973 to 2012, and was cricket correspondent of the BBC, the Daily Telegraph and The Times, as well as President of the MCC in 2011; Peter Baxter was the producer of TMS on BBC radio for 34 years; Barry Johnston is the son of Brian Johnston and compiled The Wit of Cricket book; Robert Powell is an award-winning actor and former President of the Lord’s Taverners. Copyright © 2000 - 2019. Johnners.com. All rights reserved.